So am back after a lovely few days away in the west of Ireland. Kerry really is beautiful! 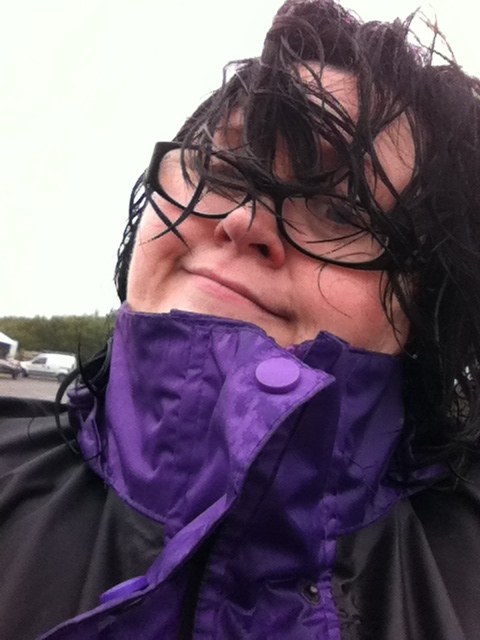 On Monday we got soaked to the skin and on Wednesday I got sunburn! We had a great time. Even though I’ve been blogging for more than 5 years now, the ‘I want to write!’ thing is still quite new to me. I’ve read almost every ‘How to be a better blogger/writer etc’ article that I’ve spotted. Some of it seems nonsense to me but there are some gems that I’ve gleaned and stored away for further peruuuuuusal! 😀 But there’s one tip that has been on almost every list. And that is – if you want to be a writer, you have to be a reader. All I’ve been reading for the past few years are theology books. (Apart from the odd holiday indulgence and my annual read of Pride and Prejudice.) In 2007 I decided to actually FINISH my Theology degree (after starting in 1994) and then went straight on to do my Masters, which I’m currently in the middle of. So everytime some one recommends a great book, all I can think of is the pile of textbooks I should be wading through. But I’ve decided that I have to read other stuff so am now always going to have one non M.A. book on my reading list. As I’m from ‘old Tallaght’ the heartwarming, neighbourly feel of The Terrace reminded me of my childhood. I could see my mam at the gate talking to neighbours as they passed by. 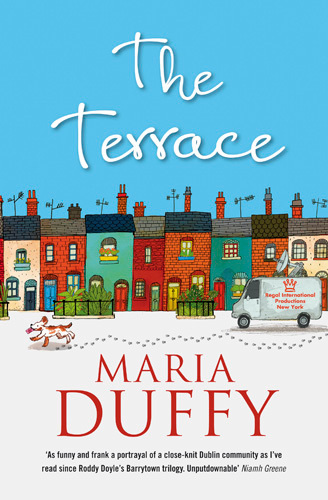 The Terrace is about just that – a row of houses, the people that live in them, and the connections between them. There’s a ‘days of old’ open-door culture throughout the book that again, reminded me of my childhood. A lot of the story centres round the other thing that binds them – the missing lottery ticket that someone in the syndicate has, but no one can remember who…! I am quite convinced that Maria Duffy could walk into the conference room where the script writers of Coronation Street/Eastenders/Hollyoaks/Fair City are gathered, and immediately take her place as part of the team. I reckon that if you like your soaps, then The Terrace is the book for you. The problem is… I don’t! I gave up on soaps years ago and much prefer my intrigue to be about whether the President’s special advisor is actually the baddie who stole the launch codes – rather than, who had a drunken fumble with who after the pub last night. It’s a preference thing, I know. I did tire a little of the popping in to each other for tea… and wanted things to move a bit faster. But there are two things about this book which I loved and applaud Maria for. One is that I consider it an honest and real portrayal of how money affects things. The lost lottery ticket caused a lot of trouble. Accusation and counter-accusation rolled around the houses on the terrace as suspicion fell on almost everyone at some stage. Suddenly this tight-knit community that trusted each other with everything, began to lose their faith in each another and (mis) interpreted every move. Not only that, they began to lose faith in the community itself. It’s the reason lawyers tell families to put stuff in writing and the reason that God warns us not to love it too much… money changes us! The other is the fact that Maria does one thing that the soaps tend not to. She portrays marriage as worth fighting for. One of the reasons I hate the soaps is that everything is so temporary and someone can be madly and passionately in love with someone and a few weeks later be equally madly and passionately in love with someone else. Family ties and relationships are strong in The Terrace. They’re worth working at even in the midst of a whole heap of misunderstanding, temptation and heartache. And that is another part of our ‘once upon a time’ culture that is in danger of dying. But it’s alive and well in The Terrace. Not my usual genre, but a great read. All the more special having met the beautiful lady who wrote it. “I Am What I Am” – Could I live by this Paralympic anthem? Pingback: A Review of Some Holiday Reading #2 Sons of Cain by Val Bianco | Just another Christian woman… talking through her hat!